Silentium est aurum (“silence is golden”). If we google “teaching speaking + English activities”, we’ll get over 91,200,000 search results with numerous tips, ‘fabulous’ games, tricks how to get them speaking, magic formulae of success – all pointing out the same frustrating fact that many learners of English are either timid speakers reluctant to speak, or that despite doing a great number of grammar and vocabulary exercises in class (with which they have little difficulty), their speaking still lacks fluency and coherence. The latter is sometimes ignored at lower levels. However, we should note that speaking is not about fluency, but fluency and coherence. Below, you will find some suggestions how to help our learners form the “sea” and organize what they say into a coherent speech. Coherence is about linking ideas together – just like in a paragraph or essay. This means organising what you say so that your answer is “a whole“. All the bits within it fit together. This should be familiar from writing. The difference in speaking is that the structure is looser. 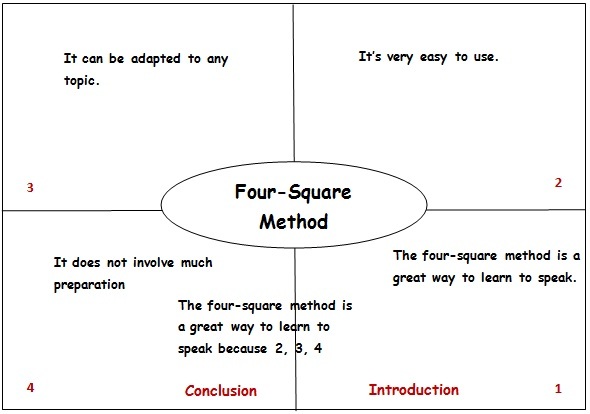 Today I will show how to use a four-square method to teach speaking. Although it is mainly used for teaching basic writing skills (usually to primary level school kids), it can be successfully applied to teaching different forms of speaking as well. 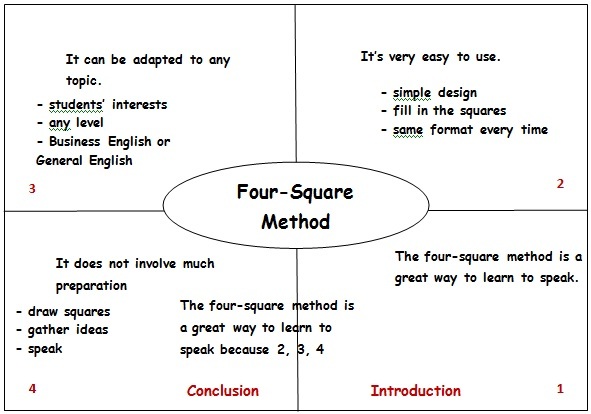 The 4-square method is a graphic organizer that helps organize concepts, vocabulary and grammar in a way that is easier and much simpler for our students to grasp. (* Please mind that I’m using a different order of squares than in the original method. You can find the classical 4-square method description here. As I use this organizer to teach public speaking as well, I find it more convenient to devote 2 squares to the Introduction and Conclusion, and put them close together). Choose a main idea (topic) and put it the center box. 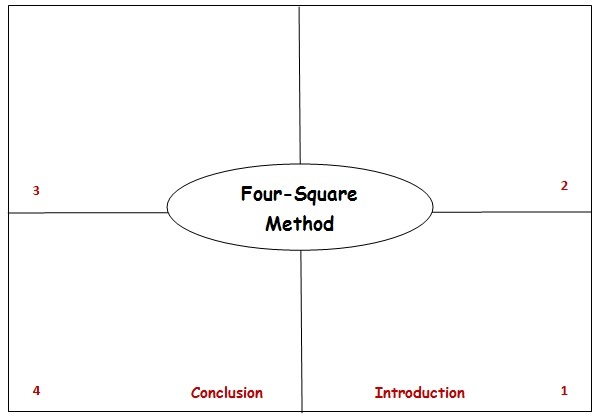 Boxes 1, 2, 3 and 4 will contain the introduction, reasons, examples, and explanations that support the topic, and conclusion. Now we will add supporting ideas (2, 3, 4). These supporting ideas will be used to wrap up our speech. Now we need to add details (reasons, examples and explanations) supporting our ideas. Once we have made a general outline of our speech, we should bridge the gap between our ideas with the help of transition words (connectors and linkers). Your speech is ready. Practice time. Keep it simple. 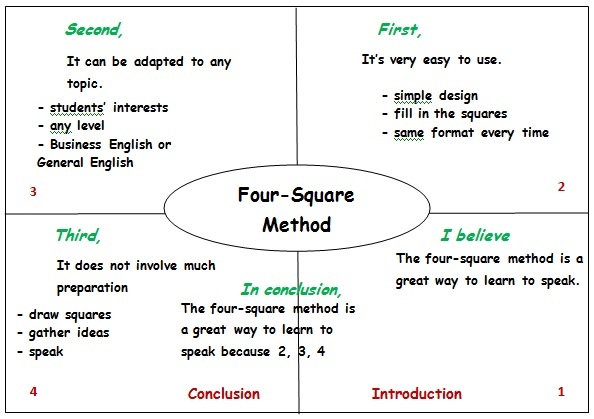 It is important for students to understand the relationship of ideas in the four square format before moving on to some more elaborate forms of speech. Do not introduce all the points and forms of details at once – do it gradually by adding one additional supporting point in each square. 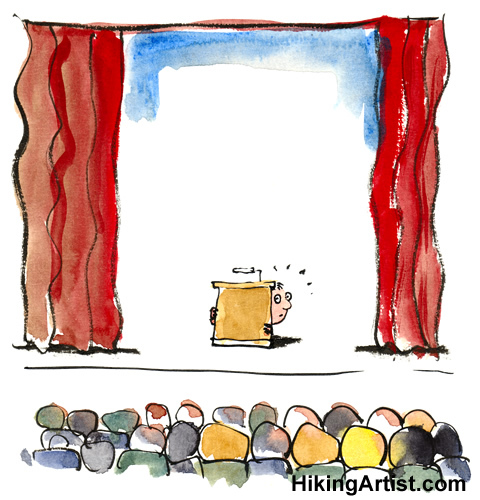 Introduce variety – show different supporting points that may be used by students, e.g. stories, statistics, jokes, etc. Use the same prompt repeatedly when introducing the steps because the familiarity aids instruction. Practice linking words. Do not provide a long list of linkers, introduce them gradually. Make it fun and build in surprises – it will boost students’ memory. Give some interesting topics like “Daytime naps in the classroom/at the working place”. Get your students to record their speeches (put their cell phones to good use), listen to what they said, think about more detail to add in, focus on connecting ideas, and repeat until they have something they are happy with. Provide for peer and self-assessment. Don’t limit creativity. This tool is just an organizer of thoughts and ideas. You can use this method further to work on storytelling (by placing particular questions in the squares), public speaking (making presentations) and 4 corner debates. 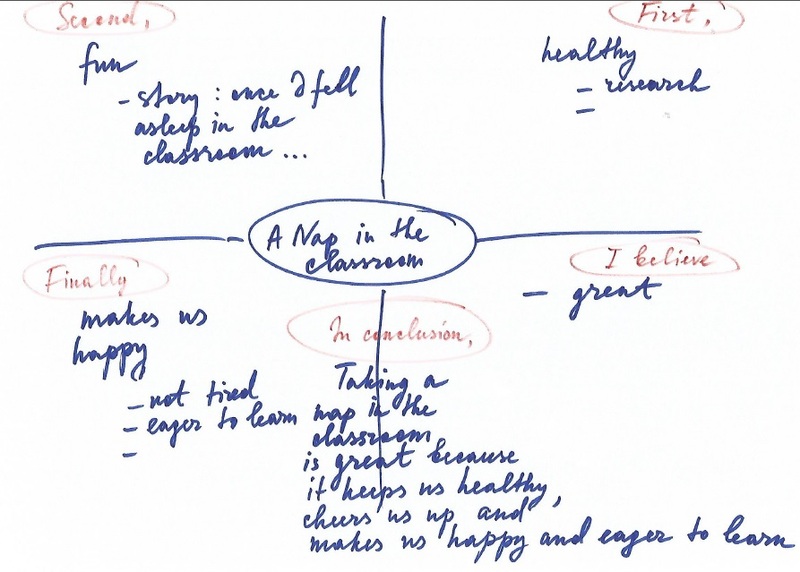 Please leave me a comment if you want to learn more about the use of this graphic organizer in the classroom. Guidelines to effective presentations with some tips and tricks I’m using to teach public speaking.